In areas that experience freezing temperatures, winter mulching differs from mulching during the growing season. We mulch our gardens in the spring to suppress weeds, retain moisture and feed and warm the soil. While we may spread a layer of soil conditioning compost or manure in the fall, the primary reason for winter mulching is to protect our plants from the harsh conditions of winter freezes, thaws, and winds. The main idea behind winter mulching is to keep the ground frozen by shielding it from the warmth of the sun. A steady temperature will keep the plant in dormancy and prevent it from triggering new growth during a brief warm spell. Tender, new growth too soon will just result in more winter die back. Mulching now will also help conserve whatever water is in the soil, so hopefully, you’ve been keeping your garden beds watered right up until the hard frost. When Should You Apply Winter Mulch? Protect Crowns & Surface Roots: (Especially newly planted plants) Mulching to protect most perennial plants is done when the soil has started to harden, which is generally after the first hard or killing frost. A hard frost is usually defined as when temperatures drop to below 25 F, but you’ll know it when you see the last of the hardy annuals crumbled and brown in the morning. At this point, your perennials should be well into dormancy and mulching around them won’t encourage tender new growth. The ground has had time to chill and absorb fall moisture. Go ahead and spread a 2 to 4-inch layer of mulch around the base of the plants. Grafted plants, like hybrid tea roses, benefit from being mulched more heavily. These are usually mulched with compost or soil and are actually buried to just over the graft union. You can pile the soil up around the stems or you can use some wire fencing and fill with compost. Prevent Desiccation: Some shrubs that are evergreen or somewhat evergreen, like rhododendrons and viburnums, can become desiccated by harsh winds. You can protect the branches and buds by wrapping them with burlap or by spraying on an anti-desiccant, like Wilt-Pruf. (Anti-desiccants are handy to have around. You can prolong the life of your Christmas tree with a spray. They’re also good for coating carved pumpkins.) If you choose to wrap your shrubs, make certain there is space between the branches and the burlap or the burlap will freeze onto the branches and cause its own problem. You can also fill the space between the shrub and burlap with leaves, for additional insulation. Woody plants don’t require as much protection as herbaceous perennials. 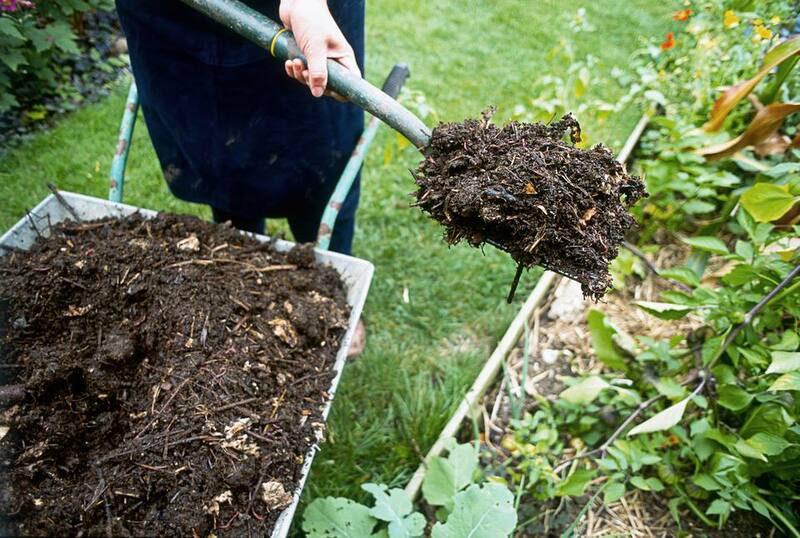 However, a 2 to 4-inch layer of shredded bark mulch or compost does help conserve the ground moisture. Just be sure not to pile it around the base of the plants. Keep it several inches from the stems or you’ll invite rodents, like voles and mice, who like the cover of mulch while munching on the bark. Mulching up against the stems also holds too much moisture against the plant, providing ideal conditions for diseases to take hold. Prevent Heaving: When the ground repeatedly freezes and thaws, it expands and contracts. When a plant is sitting in ground that expands and contracts, its roots get loosened from where they are anchored underground and the plant eventually gets pushed up through the surface of the soil, exposing its crown and roots to freezing temperatures and drying winds, which brings us right back to Reason to Winter Mulch #1. Again, you would wait until the top of the plant has died back and the ground has frozen, before applying a layer of mulch. Prevent Erosion: (Especially important for fallow gardens, like vegetable gardens during winter.) Mulching unplanted garden beds can be done at any time in the fall. Ideally, you would plant a winter cover crop and let it sit until you till it under in the spring. If you choose not to plant a cover crop, it would still be beneficial to spread a layer of compost, manure or shredded leaves. The rule of thumb is to remove winter mulch in the spring when all danger of a hard frost is past. That’s sometimes very hard to judge, as anyone who’s experienced an Easter snowstorm can attest. However, when the ground starts to thaw and the smell of mud is in the air, it’s time to start raking and removing the mulch so that the ground can warm and new growth won’t be inhibited.